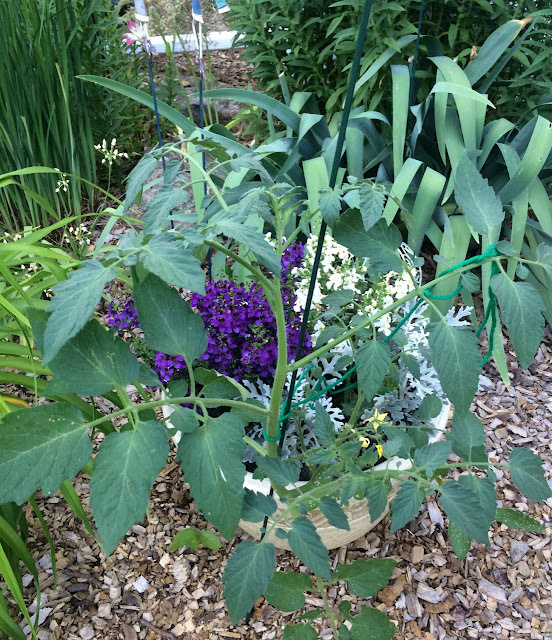 A journal of gardening and other creative pursuits. Art Charm Auction and Reveal!! 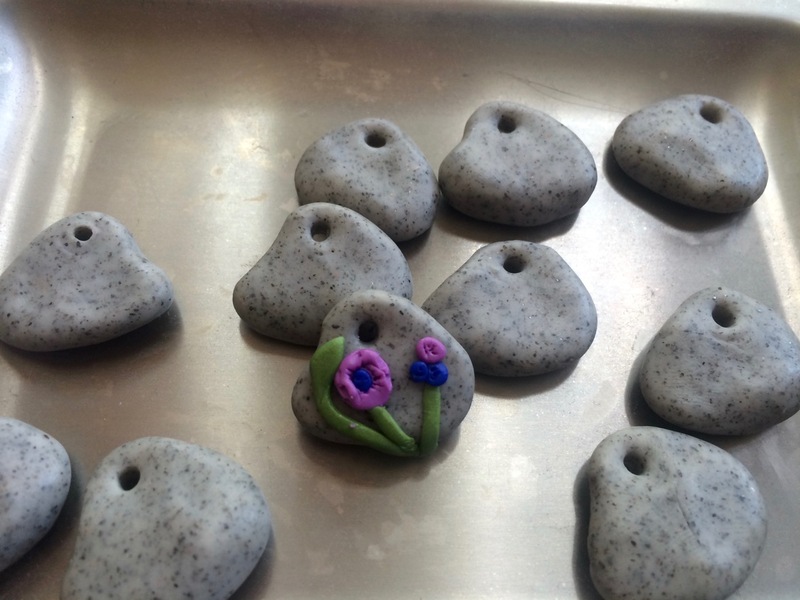 Today was supposed to be the first day of the Art Charm Auction, where the proceeds go to a wonderful children's charity called Beads of Courage. It's an organization for "arts in medicine" that helps children who are seriously ill. This auction is organized by a lampwork artist, Jen Cameron of Glass Addictions. However, there has been a last-minute hiccup with whether Ebay (the auction location) still works with Beads of Courage. The auction and reveal have already been delayed a bit due to Jen's hectic schedule this summer (getting her son off to college in a different country! ), but we're all ready now, and hoping that the issue with the auction will be resolved quickly. I'll update this page as necessary. In the meantime, here is how it works, and what I created. 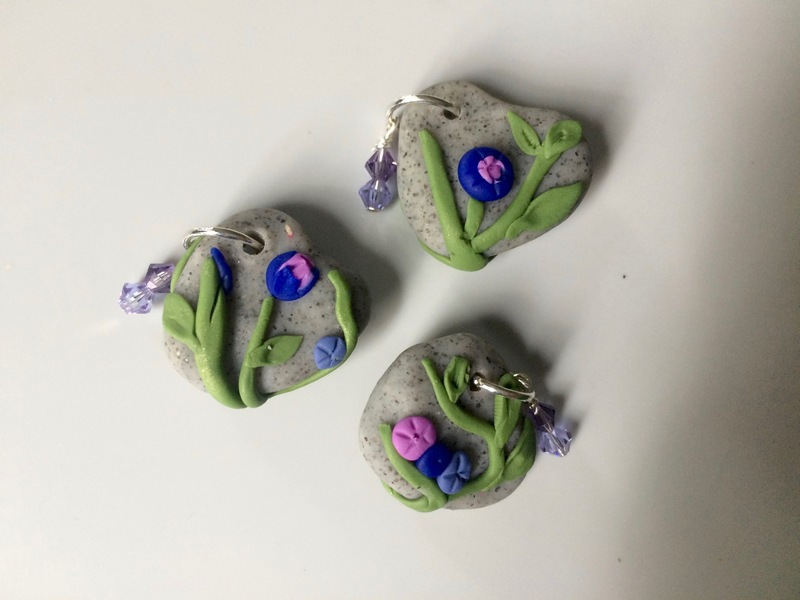 Each participating artist creates a set of 11 charms --and then we swap ten of them (Jen does the work for this) and the 11th charm is auctioned off to raise money for Beads of Courage. I've participated in this art charm auction and swap four times. Last year we raised over $1000! The overall theme for this year's auction is Fairy Tales. The theme is intended to help with inspiration and focus. There are many shared characteristics of fairy tales, but one that stands out for me is the common transition from gardens to woods. Initially I was thinking of creating polymer clay charms that were little wooden doors or gates, which might lead from a garden to the woods. 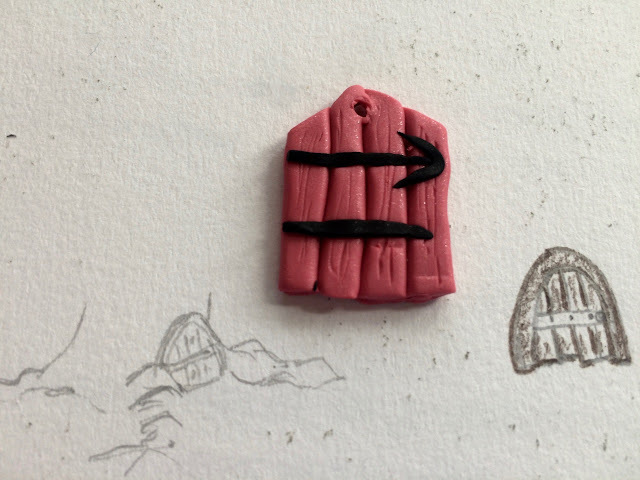 But I had trouble keeping my designs small enough to be charms. 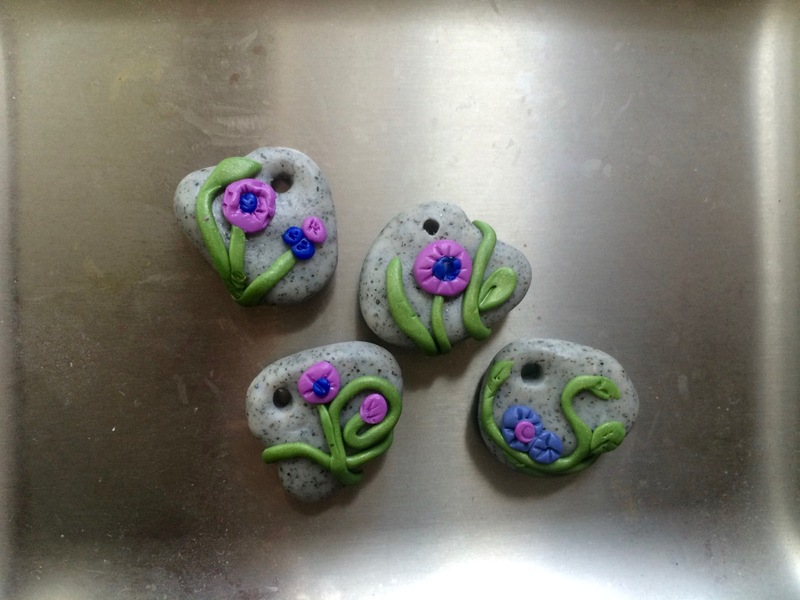 So I continued to mull over the theme, and settled on a representation of stones and flowers: a vine covered boulder. In miniature, of course, since a boulder would be a bit big for a charm. I added on a jump ring and wire-wrapped crystals in a coordinating color to finish them off. I received so many gorgeous charms in the swap. 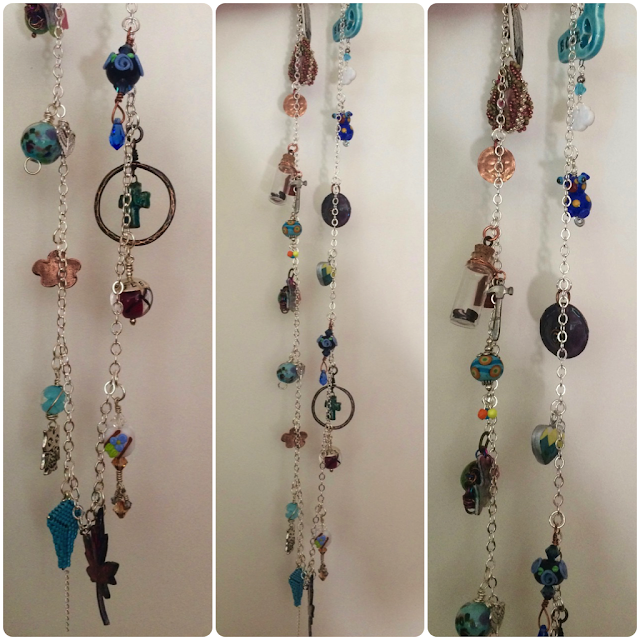 Below are a few pictures, but I would encourage you to check out all the charms created for this auction, by using the list of links below the photos. 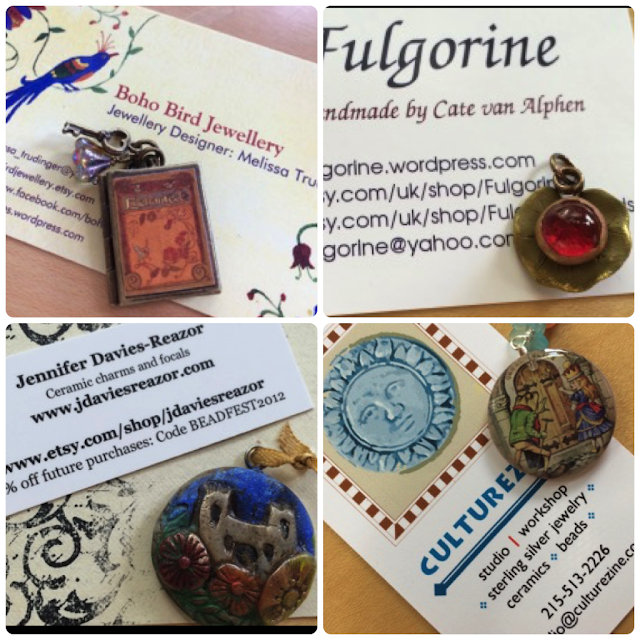 We would all love it if you'd visit the auction page as well, and bid on some of these beautiful charms! 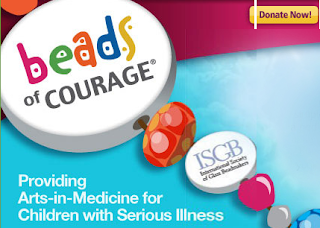 Beads of Courage is a fabulous organization, doing important work, and well worth your time and money. Summer is officially over this weekend. Emma started her sophomore year of high school last Weds, and Rob and I start teaching this Monday. I'm always ready for the routine to begin, just as I was ready for the routine to end in the spring. Emma has her learner's permit, and is getting pretty confident driving us around to run errands. Her first few days of school went well, and while she and her best friend are not in the same school districts, they are taking many of the same subjects, and are already planning how to work together on homework. It's nice to have the transition of freshman year over with, and have Emma enter this school year with more confidence. I found these photos on my phone. Emma has been trying to teach Rob how to take selfies, but I think we have a way to go. I'm also reading a book my dad recommended and is also currently reading. My dad's field is philosophy, so many of the books he reads are unintelligible to me. However, this one, called The Big Picture, by Sean Carroll, is a mixture of language philosophy, quantum mechanics, general relativity, etc. So it's somewhere between my science background and his philosophy background. We're both struggling, but with different aspects, I think. There was one chapter on entropy that I found so fascinating AND dumbfounding that I decided to read it a second time through, but this time out loud, to Rob. It made more sense for me the second time around, and I was able to share just how mind-boggling it was with Rob. Win-win. I learned a lot more about entropy in that chapter than I ever did back in the physical chemistry class I took in grad school! If you all remember, I am participating in an Art Charm Exchange and Auction to raise money for Beads of Courage. 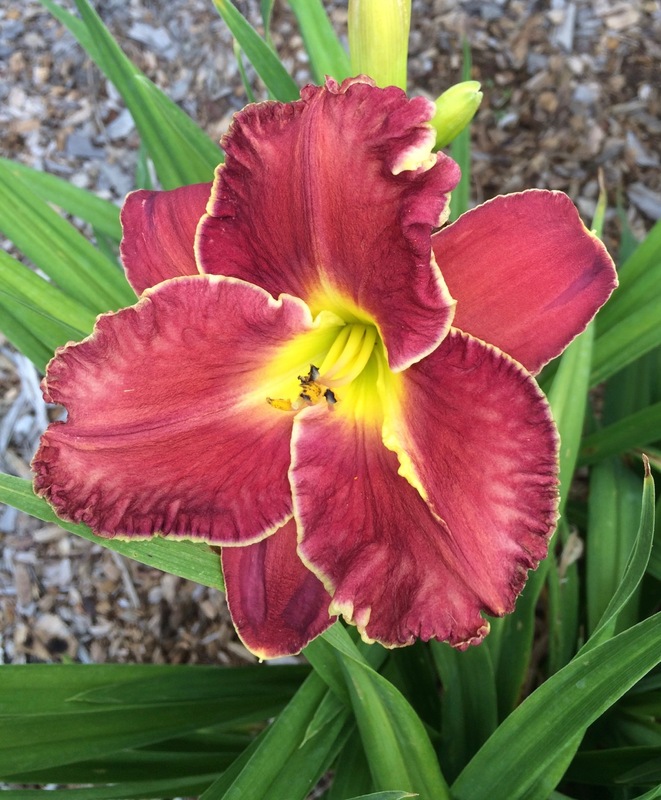 The auction and blog-reveal, which were originally scheduled for mid-August, have been rescheduled to mid-September as of now, because our host, Jen of Glass Addictions has had such a crazy busy summer. 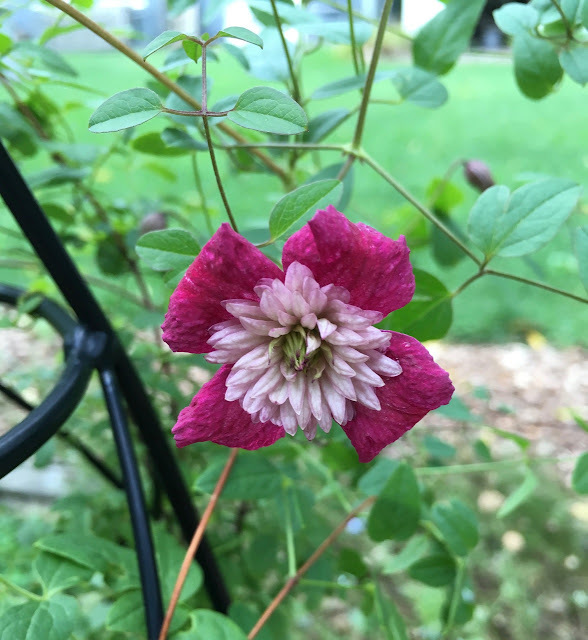 Also, waaaayyy back in spring, I transplanted a clematis that had basically never really bloomed for me. 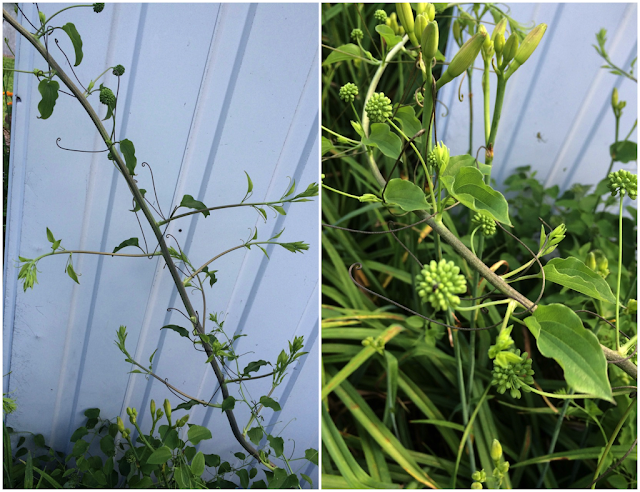 I'm so excited to see it start blooming now! I don't know if this is its regular time, or if the transplant shifted it a bit, but it's obviously much happier in it's new spot. 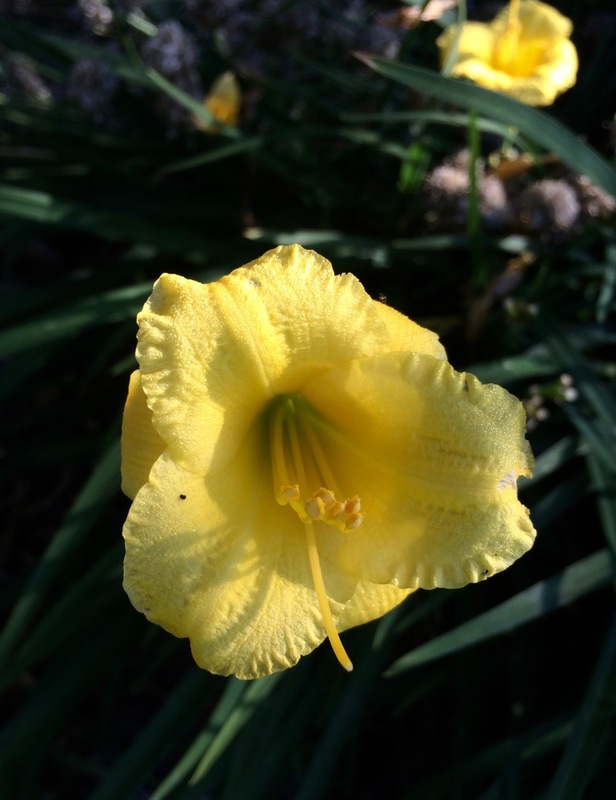 So I sent Rob out to take some photos, since he's much better at it than I am. This is a fairly small-flowered clematis, so I was excited to see more buds coming on. The flowers are a bit larger than a quarter, so quite small. But lots of lovely detail and color. I'm so happy to see it doing well. I hope everyone else is having a nice late-August! I have been buying daylily hybrids since I started gardening. I think I probably received a Roots and Rhizomes catalog in the mail, and bought several page collections. I'm terrible at remembering the names, but they thrive in my sandy soil, and add so much color in July. 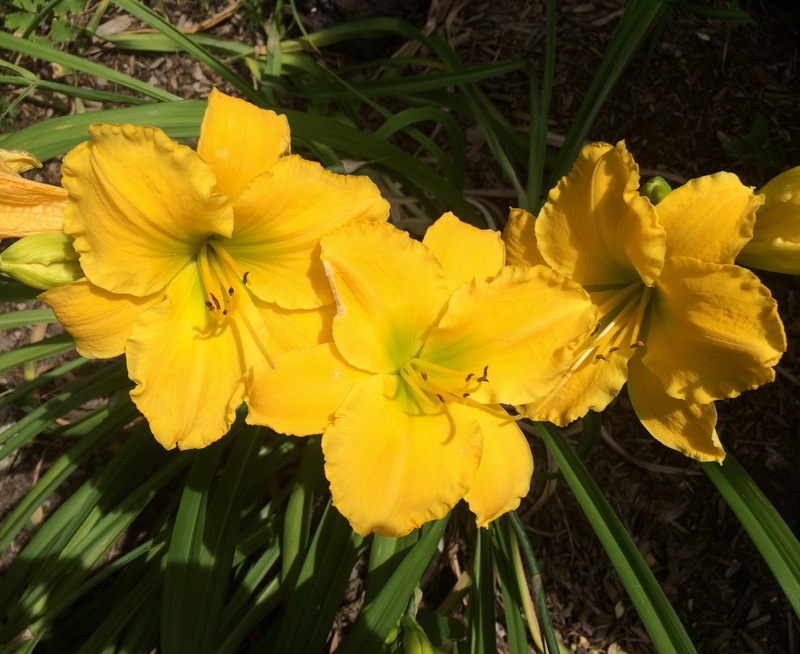 I have quite a few yellows. This tiny yellow came from a friend. 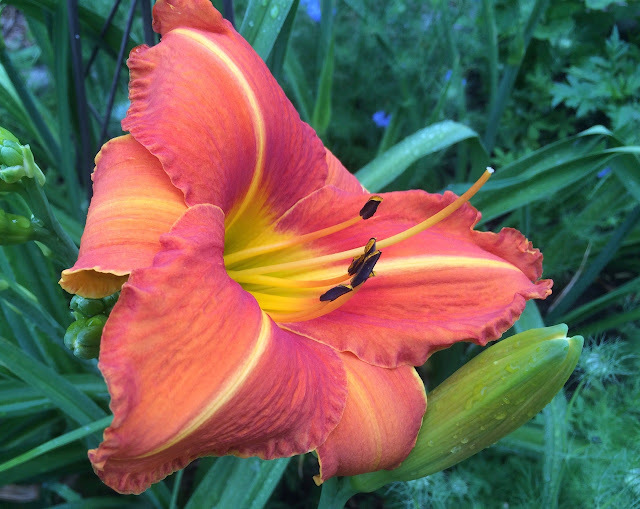 I have some fabulous orange to reds. 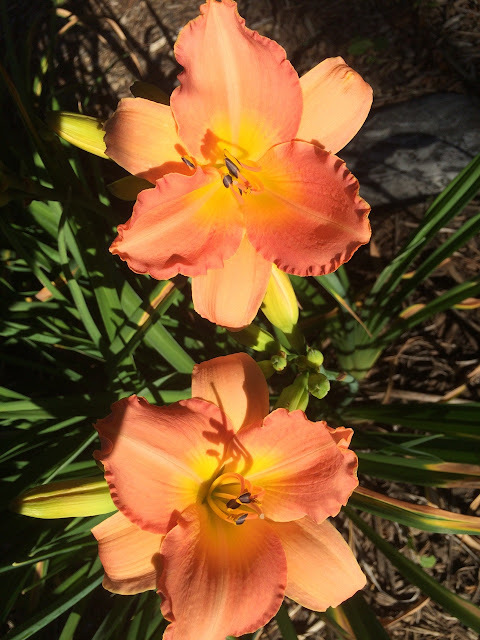 The two photos below are of the same lily, and they look more orange in real life. These attract Baltimore orioles to the garden. 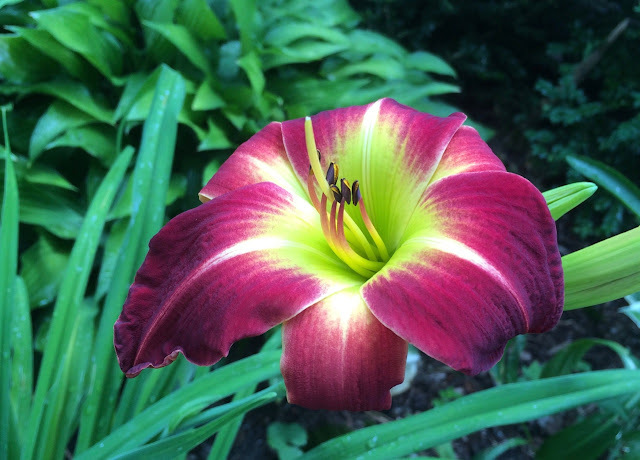 This one is more red, but sometimes the flowers get kind of spotty. 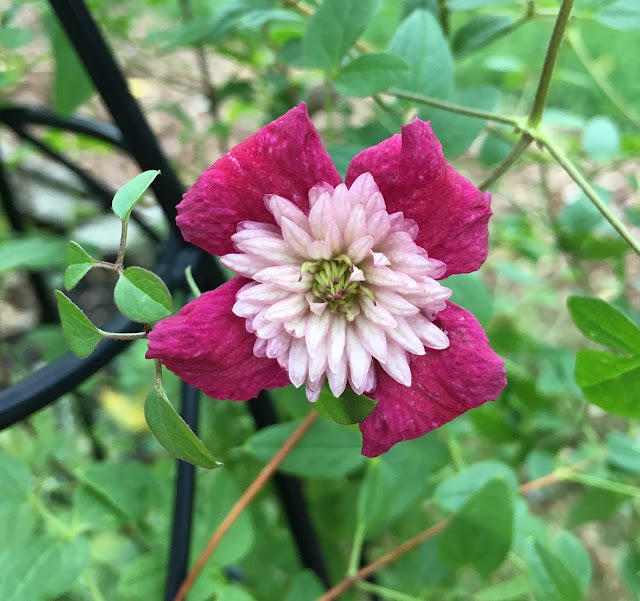 This is a rare nice-looking bloom. 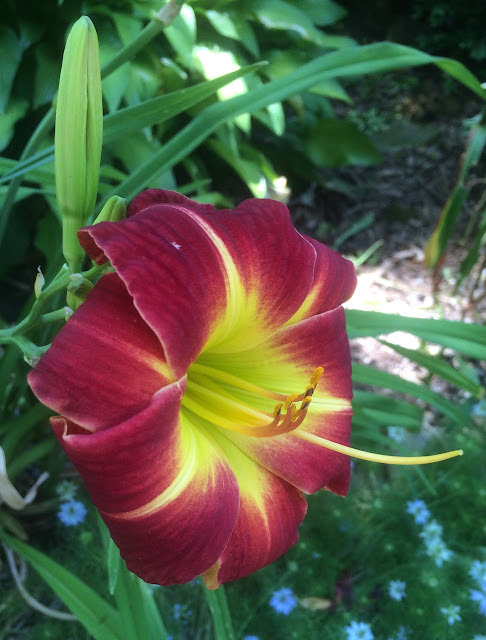 This is the most red lily I have, with a lovely green eye. Then there are the peaches, some of my favorites. 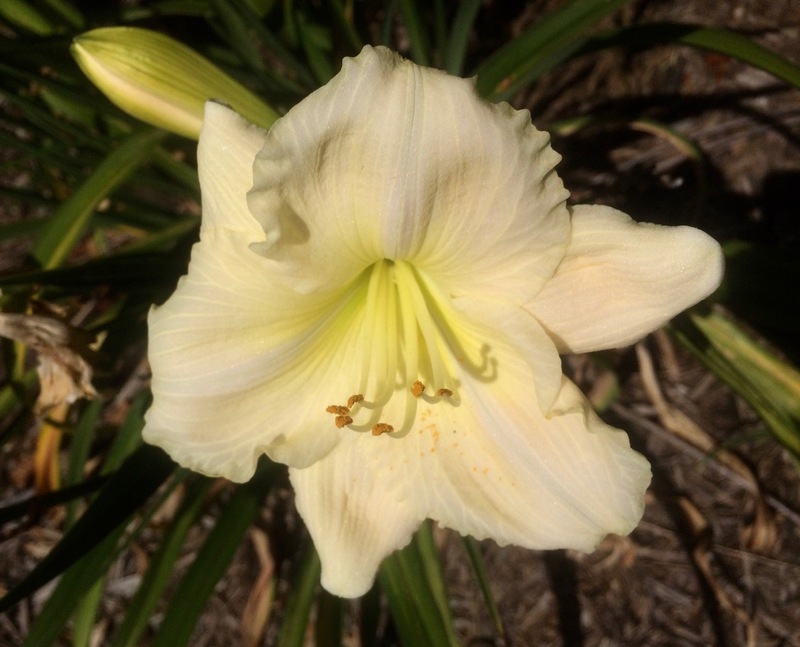 I have one creamy white as well. Back to orange again --a spider variety, and my very favorite because it adds the most amazing color to the garden. One of my first daylilies, and really the only one I remember the name of, is a pink called Strawberry Candy. 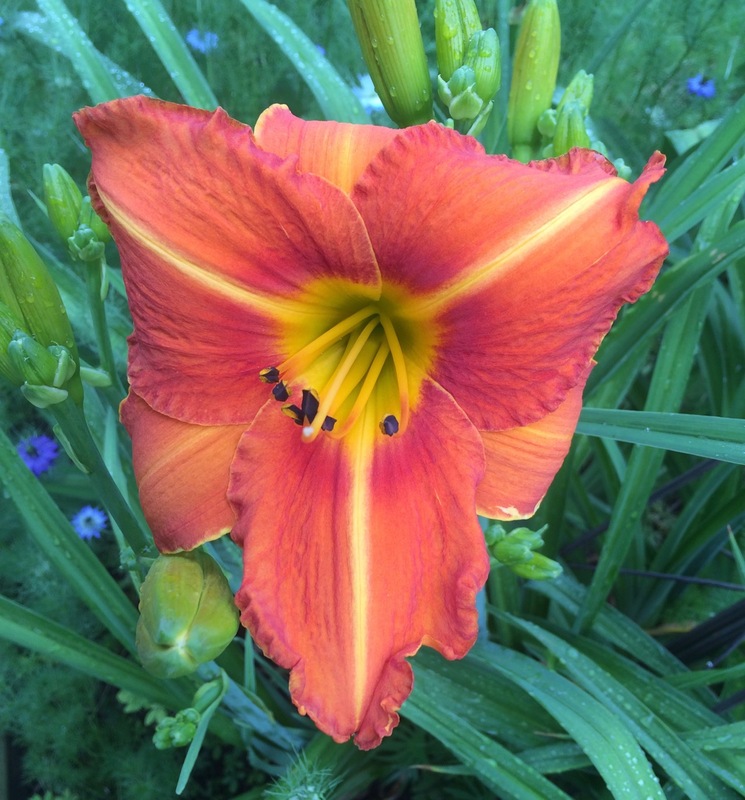 But I don't have any blooming this year because I had to move and divide the enormous clump it had become. I now have 8 divisions in various places, small but thriving. 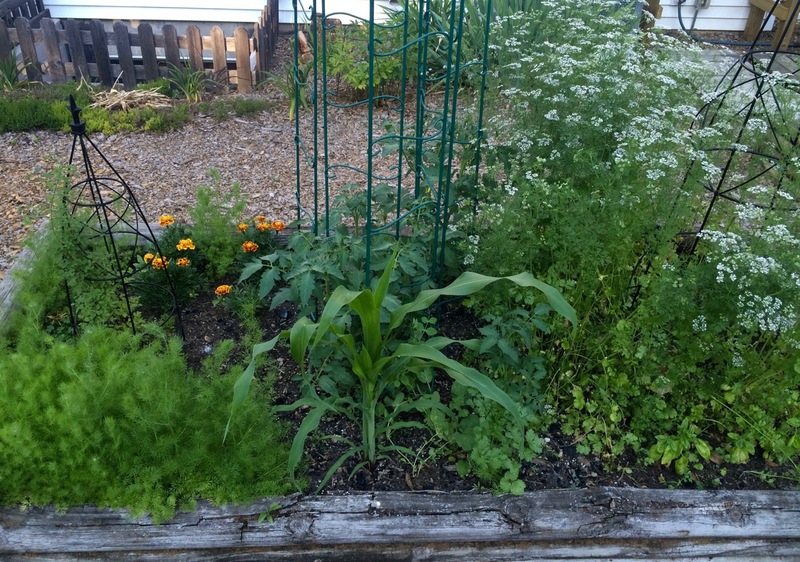 For the garden, it's been a great June. Just enough rain so I don't have to water. Enough sunshine to dry things out in between. Perennial foxglove in the shade garden. 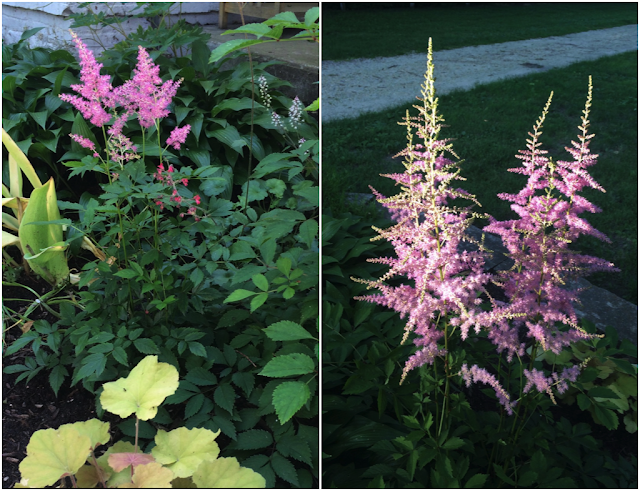 I have these two astilbe growing right next to each other, but they are such different sizes! I obviously wasn't paying attention to height when I ordered them. 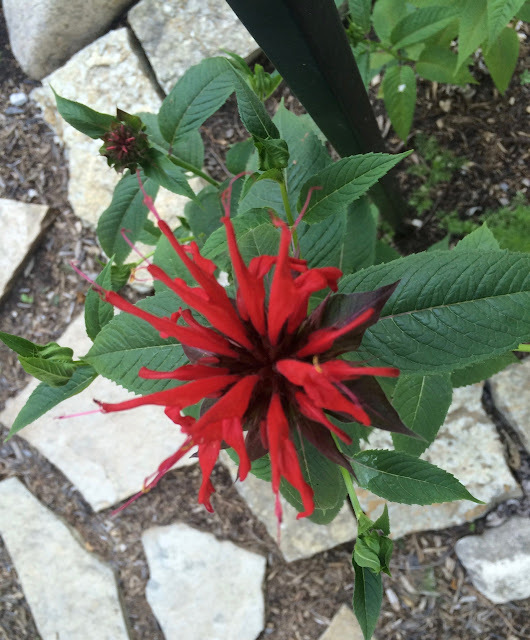 I moved the remaining bee balm last fall from a garden I've abandoned, and they are doing nicely in their new spot. 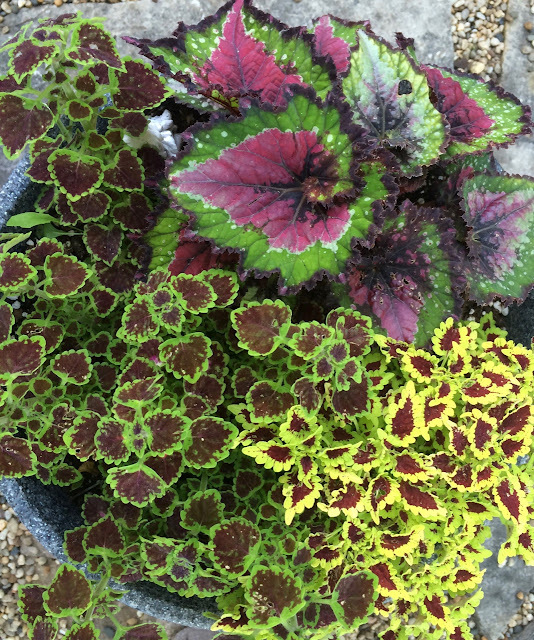 One of the containers in the shade on the back patio. I'm loving this bed --it has tomatoes, basil, cilantro, marigolds, a small leaved/flowered clematis, and then a corn and pea plant that Emma started in her biology class in cotton balls in the fingers of a latex glove :-) The corn is astonishingly big, and pea plant is climbing the tomato trellis and has flowers. We might get some peas! When Rob's dad died suddenly two years ago, he spent a couple of days in Ohio, helping John's second wife and her family sort through the things his dad had left behind. It was a mess. His dad was the type of person who never seemed to throw away any piece of paper, "just in case". If there was a surface anywhere in the house, he would cover it in record time. The bed in the spare room was completely covered, in addition to all the table-tops in the house. Rob came back from that visit pretty distressed at all the stuff his dad had kept, and pretty distressed at his own tendency to collect stuff with that same "just in case" attitude. We always joke that Rob inherited his dad's tendencies, even though Rob was adopted :-) Nurture definitely trumped nature, in this case. That event was the beginning of Rob's foray into minimalism. 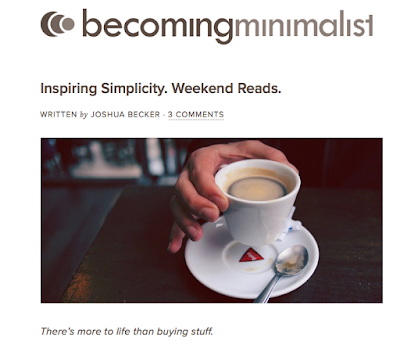 It started slowly, when he came across Joshua Becker's blog and Facebook page: becoming minimalist. Both of us began to make a concerted effort to get things we weren't using into the box we keep to collect items for Goodwill. Many trips to Goodwill later, Rob decided to join Joshua Becker's online course, where he guides you through a general decluttering over the course of eight weeks. 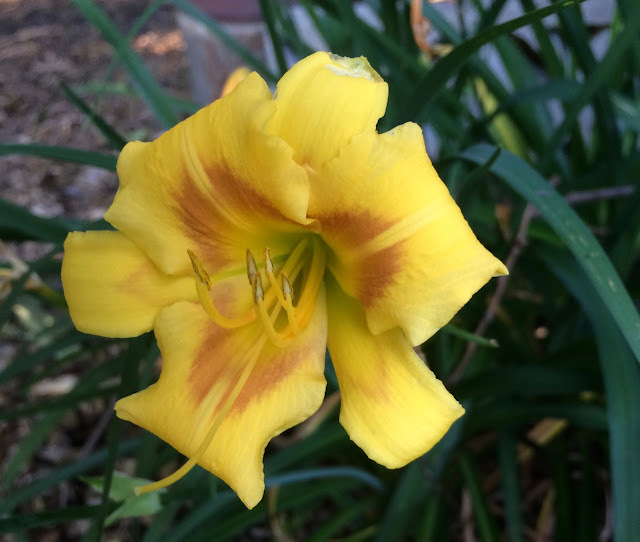 But this post is not about decluttering. While decluttering is certainly part of minimalism, it is only a small part. Minimalism is much more about living an intentional, mindful, life. 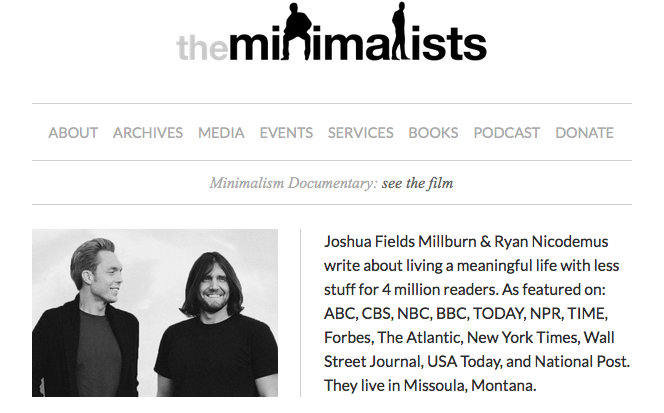 Recently Rob introduced me to a pair of guys who host a minimalism podcast, Joshua Fields Millburn and Ryan Nicodemus. Rob has been listening to their podcasts for quite a while now, and when the documentary they created came to Madison, WI, he purchased tickets for all three of us to see it. The film was inspiring, especially because it highlighted several different minimalists, in all sorts of different situations --single people, a couple, a couple with two kids, a couple with six kids-- so that you could see what living a minimalist life might look like for different people, in different situations. Soon after we saw the film, Rob ordered a book written by Joshua and Ryan. It's a collection of essays organized into general areas (Stuff, Finances, Minimalism, etc.) 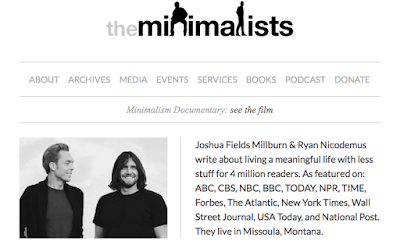 called Essential: Essays by the Minimalists. His plan was to read them himself. Rob is dyslexic, so he's generally not much of a book reader; this is why he chose this book (they've written two others) --short essays seemed more accessable. When I saw it though, I wanted to read it as well. I proposed that I would read the essays out loud (I love to read out loud). So almost every morning for the last couple of weeks, I have read one or three of the essays out loud while we have coffee, and then we spend time talking about what we've read. This has been a great way to stay mindful of living our lives intentionally, which includes not just getting rid of stuff we don't need or use, but also thinking carefully about any new purchase. During the day, I tend to think more carefully about what I'm doing with my free time --is it really what I want to be doing with my time? The really wonderful thing about this activity, though, has less to do with the various essay topics, and more to do with how Rob and I have spent this time thinking about where we want our life to go. Emma will be a sophomore in high school next year. We plan on staying here, in this house, at least through her first two years of college, and perhaps through all four. But it is helpful to spend some time thinking about what we want the next phase of our life to look like. When we first moved out to this house, we absolutely loved working on the five acres of property we have. 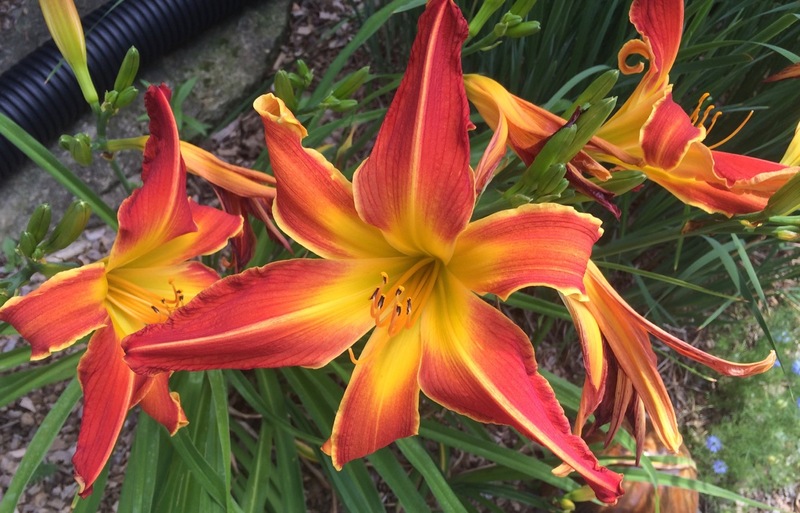 We were already 35 years old when we married; there were about two years before Emma came along, and we would work outside together almost every day of the summer, clearing weeds, creating gardens, landscaping. Over the last 15 years, as we've gotten older, the things we want to do have changed somewhat. 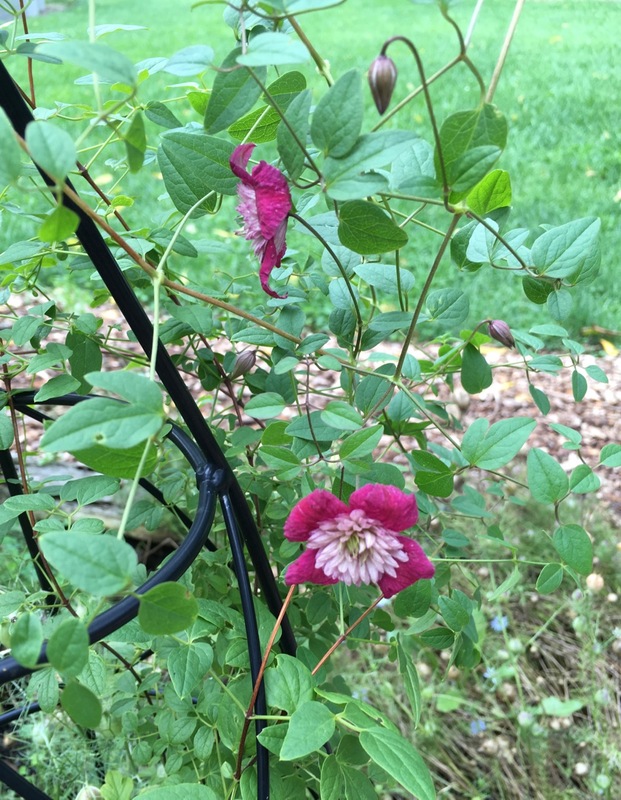 While we still enjoy some of the outdoor work (I still garden, Rob still loves to build things, whether it's a deck or a bluebird house), we now pay someone else to do the lawn mowing and trimming, and there are areas of the woods that we no longer even try to tame. While originally we thought we'd never want to move from this gorgeous property, more recently we've come to realize that we'd like to downsize for the next phase of life. We want to be more flexible and mobile so that we can do more traveling and spend less time taking care of stuff --whether that's outside stuff or inside stuff. 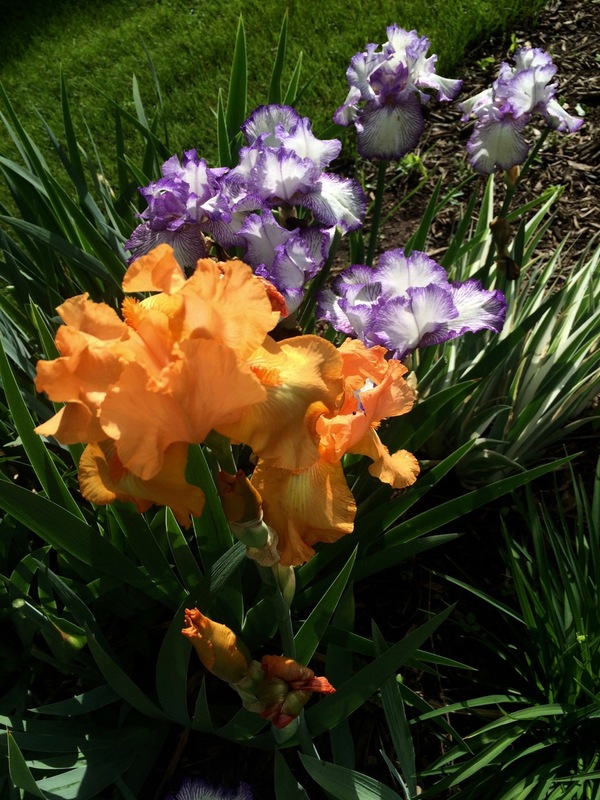 Downsizing will allow us more financial freedom as well. 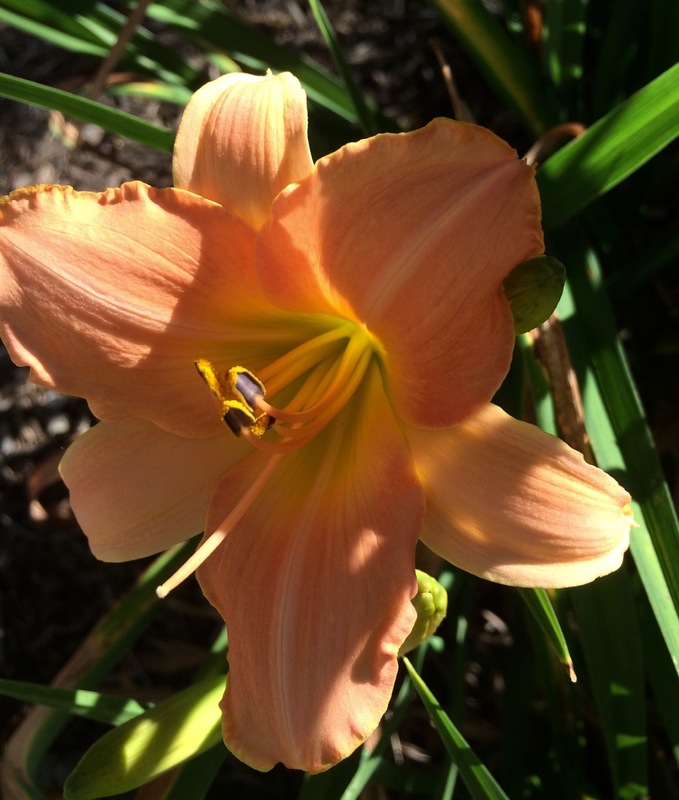 This has been a great place to raise our daughter, but that part of our life is phasing out. We want to be prepared to enjoy the next phase. As Emma has moved into her teen years, she needs us less and spends more of her time with friends. Over the last year, Rob and I have made an effort to refresh our own relationship --to shake out the dust of that time of life that involves young children, with too much to do and not enough time to do it. Whether it's spending time on the bluebird trail at Nygren Wetland, or even just running an errand together, this has reminded us of what it was like to be the two of us, before it was the three of us. The experience of sharing the essays in this book, and discussing what kind of future we want, has been a good extension of that reconnection. It's good to know that we have similar dreams for the future, but also to be aware of what the other is thinking, feeling, and planning. If any of you have had similar experiences in taking a mindful look at your life and future, I'd love to hear about them. 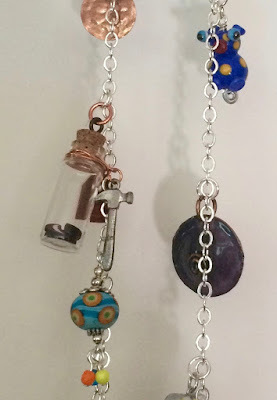 I am participating again in the Art Charm Exchange and Beads of Courage Benefit Auction! I believe this is my fourth time participating. 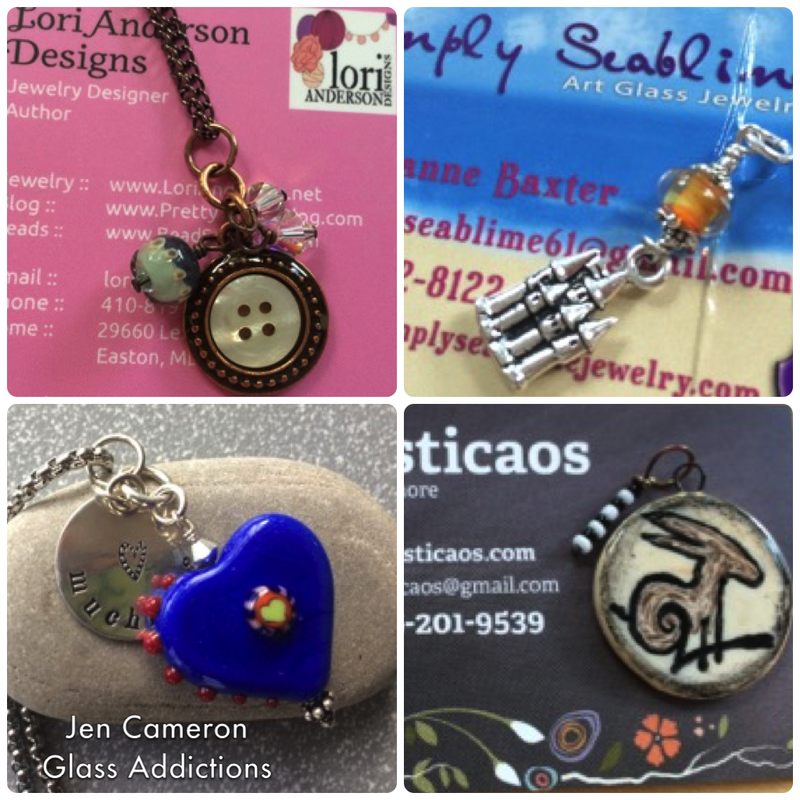 A group of about 20 bead artists creates a set of art charms, where one of each set is auctioned, with the proceeds going to Beads of Courage. If you're not familiar with Beads of Courage, it's a non-profit organization that provides "Arts-in-Medicine" for children who are suffering from serious illnesses. Part of the program involves giving the children beads to string, where each bead signifies an obstacle they have overcome, or a procedure they braved, to help them celebrate their success as they deal with actions of surviving. Some of these beads are purchased by the organization, and many bead artists also donate art beads, so that the children can pick out some special beads for particular events. 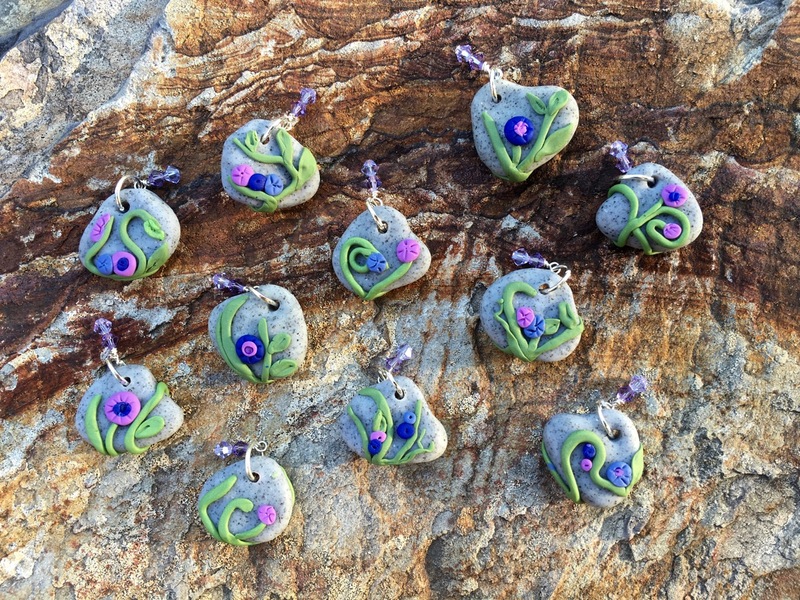 For this fundraiser, each artist creates 11 charms, and in return receives 10 charms from other participating artists. (The 11th charm of each set is auctioned.) The artist who is hosting and doing all the hard work of organizing the exchange and auction is Jennifer of Glass Addictions. Jennifer is a lampwork artist --if you're interested in checking out some of her work, she has a blog and store on her Glass Addictions website. The auction and charm reveal won't be until July 15th, but I'm currently working on creating my charms. 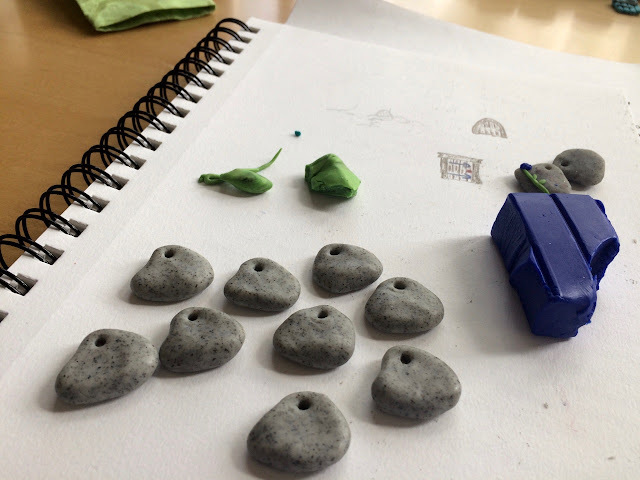 As I was working, I came across some of the charms I've received in past exchanges that I had never used in a project. I decided to search around for any others that were still waiting for the perfect piece, and string them all together to give you all a taste of what has been created for past exchanges. It's a little hard to get them all in view. The center panel below is all of them, and the two sides are a slightly closer look at some. Here's a closer look at just a few of them, including one that's such an amazing creation: It's the center left -a tiny jar with some cookies, and an attached hammer to break the jar in need. There are always so many wonderful interpretations of whatever theme Jennifer has chosen. Last year we (really Jennifer, since she does all the hard work) raised over $1000 dollars through the auction to donate to Beads of Courage. I hope you'll check back for later posts as we all reveal our charms, and check in to the auction to see if there are any charms you can't live without. 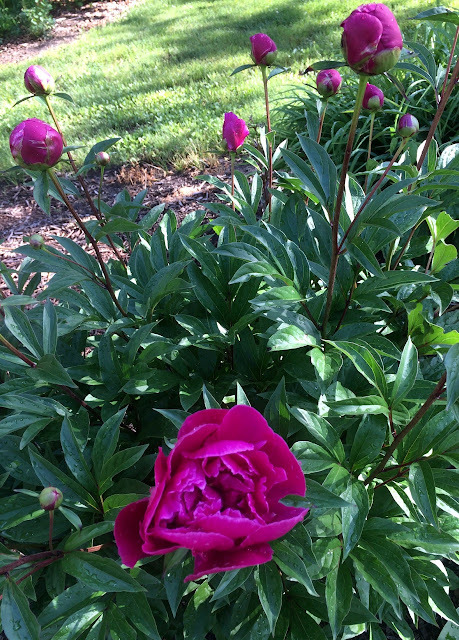 We've had a really nice spring for the garden --plenty of rain, and a long stretch of cool temperatures. It's gotten hot and humid now, but everything seems to be blooming right on schedule. 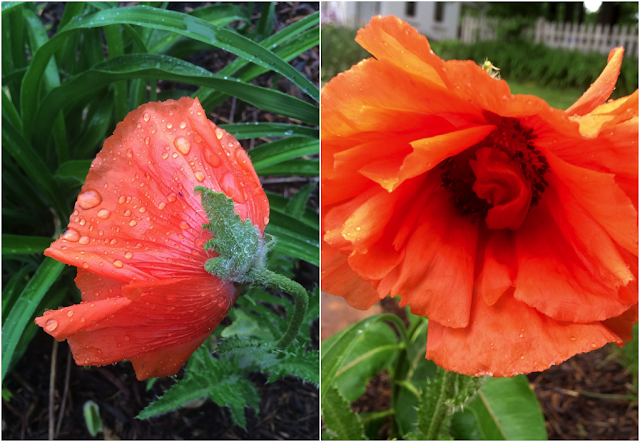 I had one poppy bloom in the back garden. 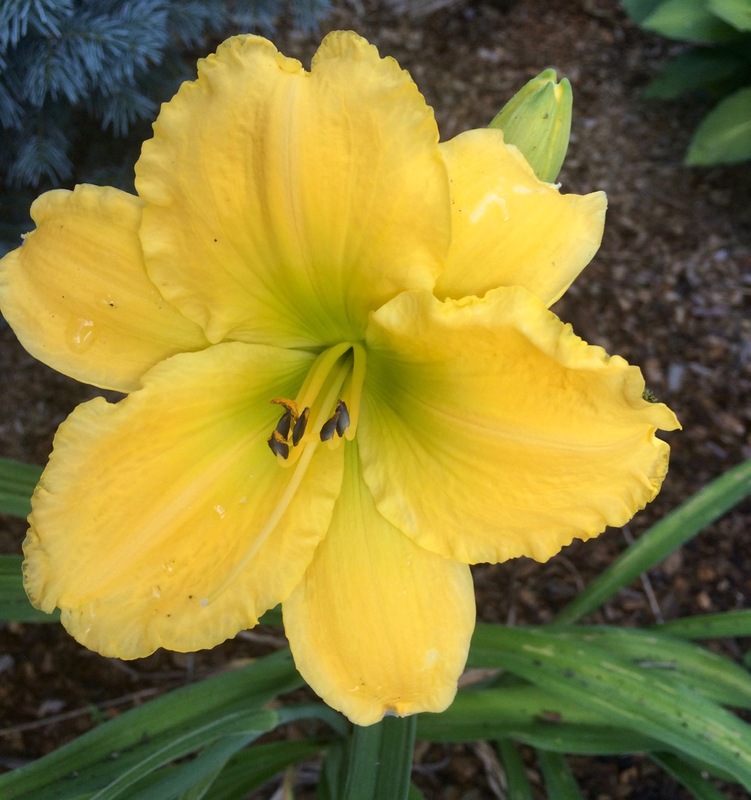 I'll be transplanting it as soon as the flower finishes. Also in the back, the purple and white iris are finishing up, and the orange iris are beginning. 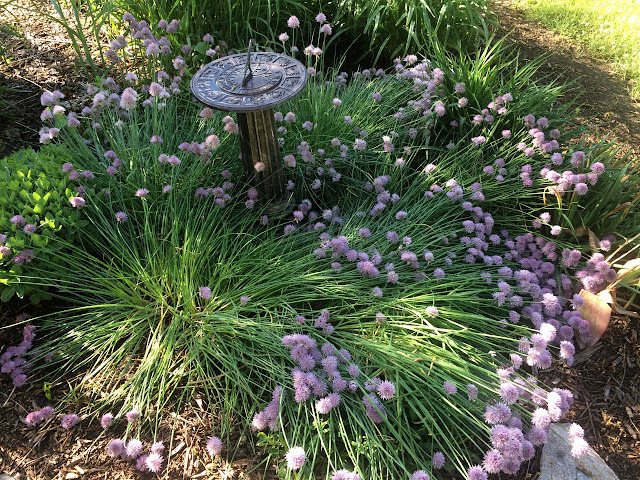 One more plant in the back garden is blooming, but it's been hit hard by the pounding rains we've had over the last two days, so it's splayed out in a starburst --the chives. 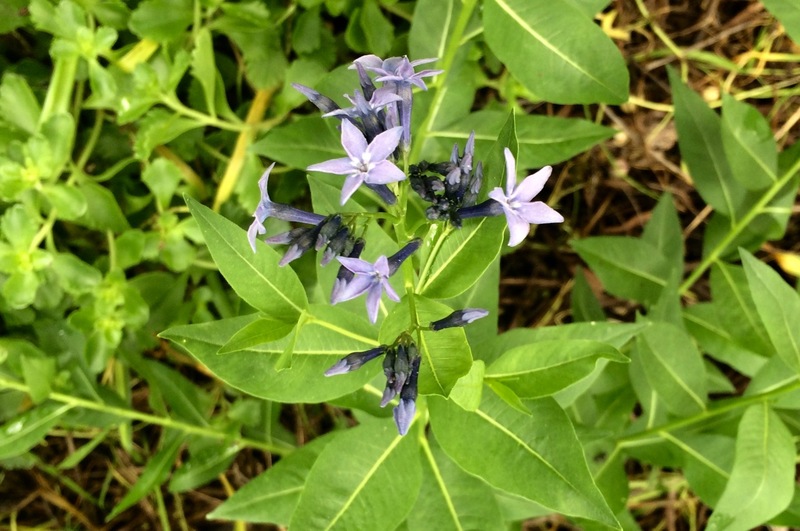 My bluestar amsonia is just beginning to open its buds. 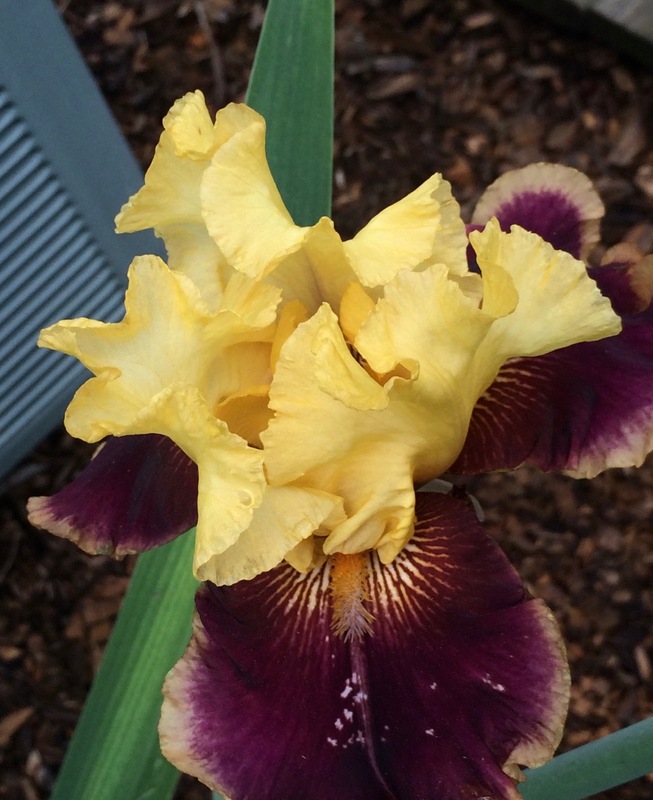 And an iris along the side of the house is also blooming. 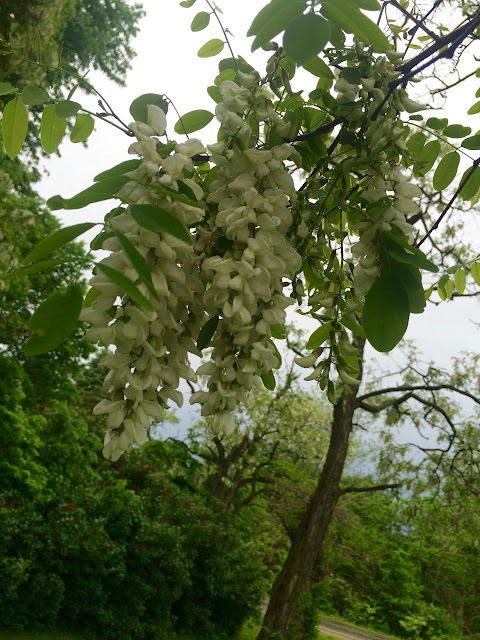 The black locust trees are also blooming right now --we have quite a few on the property, and the scent is heavenly. The flowers are very similar to wisteria (which is not hardy in our cold winters). I love these trees, even though they can be invasive. 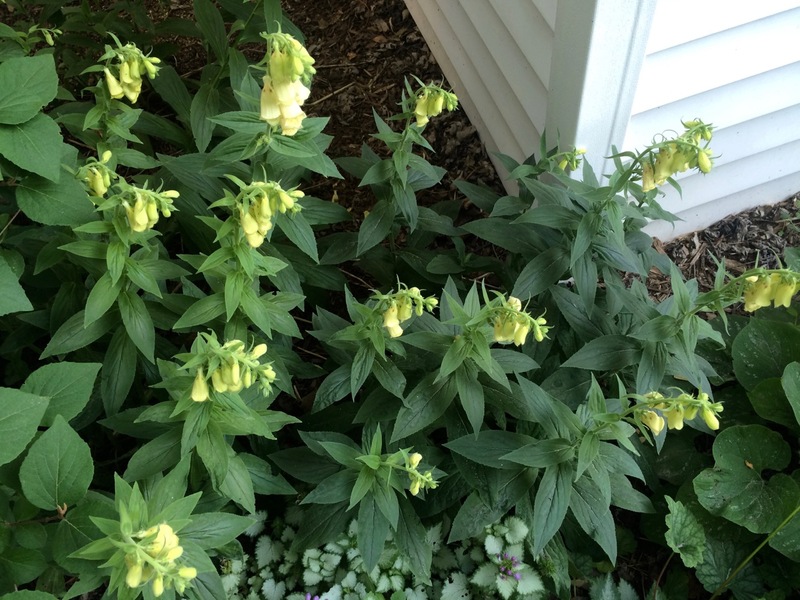 Although, I don't know if you can use the term "invasive" since they are native to North America. They're just very prolific. 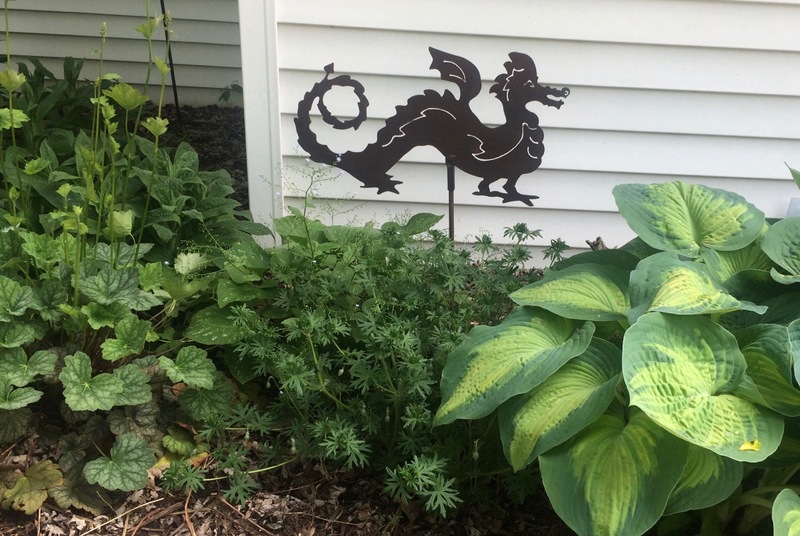 I've also added a bit more garden art (inspired in part by a post by Casa Mariposa). I picked this piece out for Rob, who loves dragons. If you have a library and a garden, you have everything you need.